I am huge fan of cookery shows and cookbooks. Whenever I find some recipe interesting I generally note it down. This is one such recipe that I saw in a regional cookery show called Bombaat Bhojana. 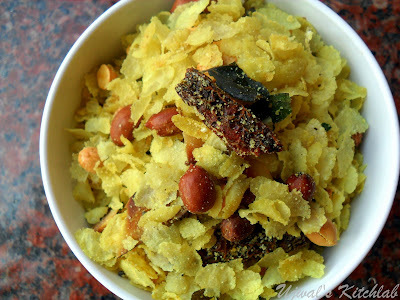 This is a simple poha chivda recipe. I made slight changes as per our taste. 1) Prepare seasoning by heating oil. Add mustard seeds, when they splutter add cumin seeds. When they sizzle add Kopra pieces and peanuts. 2) When the peanuts turn golden add torn red chilli, fried gram, curry leaves. Fry well. Add haldi. 3) Keeping the flame on medium add Poha. Mix well. Add fried gram powder. Mix well. Add salt and sugar. Mix and turn off the flame. Cover and let it cool. Store in a clean dried air tight container. * If you are unable to sun dry it then you can add poha and fry it on low flame until crispy. This can be serve on its own. You can add grated coconut at the time of serving or add chopped onions, coriander leaves and grated coconut at the time of serving. Poha with freshly grated coconut and a sprinkling of sugar can brighten me up anyday!! Ujwal, you have posted one of my favourite khana. I like this one with freshly grated coconut. Looks yummilicious. This is one of my favorite snacks, looks delicious ! Chivda looks yummy n mouthwatering..